January 31,1862…General Order #1 released by President Lincoln whereas Federal forces will begin their advance by Washington’s birthday, February 22. February 6,1862… General U.S.”Unconditional Surrender” Grant receives the first major victories for the Union. Fort Henry and Fort Donelson in Tennessee are captured. February 20,1862…President Lincoln and wife Mary Todd Lincoln suffer the death of their 11 year old son Willie. March 9,1862…the historical battle of the U.S.S. Monitor against the C.S.S.Virginia (formerly the U.S.S. Merrimac) by Norfolk,Va. ends in a draw. The end of the era of wooden ships. April 6-7,1862…”BATTLE OF SHILOH” (Pittsburg Landing,Tenn.) General Grant loses the first day as Confederate troops launch a surprise dawn attack rolling back the Federals almost 2 miles. Grant will win day 2 and call it a Federal victory when the rebels retire falling back to Corinth. April 16,1862…The Confederate Conscription Act enacts a draft to fill the CSA ranks. All men 18 -35 years of age are eligible for 3 years of service. The age limit will be raised 5 months later to 45 years of age. One year term soldiers are raised to 3 years. Many unhappy rebels. April 24,1862…”Capture of New Orleans“, a seaport of extreme importance to rebel defense supply falls to Admiral David Farragut. Etched in history when he yells “Damn the torpedoes, full speed ahead” while fighting his way through a Mississippi River minefield. The city remains defiant as armed mobs attack Federal sailors. May 31,1862...Battle of Seven Pines ( also Battle of Fair Oaks ). The start of “The Peninsular Campaign”. June 1,1862…Robert E. Lee replaces Joseph E. Johnston wounded at Seven Pines as commander of the Army of Northern Virginia. June 25,1862…”The Seven Days Battles” begin as Lee’s Army of Northern Virginia engages McClellan’s Federal forces for the next seven days. The first engagement is an attack by the Union on June 25,1862 at the Battle of Oak Grove. The next 6 days will be a test for ‘Little Mac” as Lee attacks the Union forces at Beaver Dam Creek ( Mechanicsville) on June 26th and Gaines Mill on June 27th. Lee will continue to press and test the Federal Army and Mac as he keeps the pressure on, attacking again on June 28 and 29 at Garnett’s and Golding’s Farm. Lee continues to ask more from his exhausted men as he attempts to intercept and crush the Federals on June 30 at The Battle of Glendale, however the Union Army narrowly escapes and digs in for another well designed Confederate attack at a place called Malvern Hill. This battle will be a terrible waste of young Southern lives as Lee’s confidence gets the best of him. Lee will order direct frontal attacks on strong Union infantry and artillery positions that do not break. 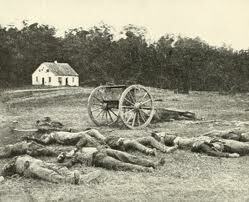 Expecting such an attack, the Federal artillery officers had aligned the 250 pieces of artillery almost spoke to spoke. Effectively this is the end of McClellan’s “Peninsular Campaign”. August 29-30,1862…“SECOND BATTLE OF BULL RUN” as the Federals under General John Pope are defeated. Blame falls on General Fitz-John Porter for holding troops in reserve too long. One of the main reasons historians feel resulted in several major Union failures. September 15,1862…“Capture of Harpers Ferry” . R.E. Lee divides his smaller army and outflanks McClellen gaining supplies and over 12,000 Union prisoners at Harpers Ferry, W.Virginia. September 17,1862…“BATTLE OF ANTIETAM” (Battle of Sharpsburg, Md.) America’s bloodiest day in history. Over 25,000 casualties with the outcome a draw disappointing President Lincoln who wants the Army of Northern Virginia destroyed. Historians felt “Little Mac” did not commit enough reserves into the battle. Only 2/3 of Federal units were engaged . However, he did stop Lee’s army which now falls back to Virginia to regroup. McClellen considers Antietam a Union victory. Watching the U.S , the British and French hold back on their planned recognition of the Confederacy. November 7,1862…President Lincoln has grown impaitent with McClellen’s “lack of attack” after Antietam. He mentions to Mac “if you don’t want to use the army, I should like to borrow it for awhile”. McClellen is replaced by Major-General Ambrose E. Burnside after Lincoln visits Maryland and Mac in October. December 11-15,1862…”BATTLE OF FREDERICKSBURG“. The newly appointed General Burnside suffers unnecesary losses especially on Dec.13 when the Grand Army of the Potomac moves too slowly attacking Lee across the Rappahannock River. The attacking Federal brigades were cut down so efficiently by well entrenched rebels atop Marye’s Heights that even rebels later stated “it was murder”. Even General Lee is moved. He will later mention…” it is well that war is so terrible, or we should grow too fond of it”.